On Twitter, lots of people take part in Follow Friday, sharing with their followers their favourite people to follow. I just checked my blog stats and I have almost 900 followers but I haven’t had the time to check out all your blogs and follow back so let’s copy Twitter and do a blog Follow Friday. If I don’t already follow you, comment below with a link to a post I should read and I will follow as many as I can today! 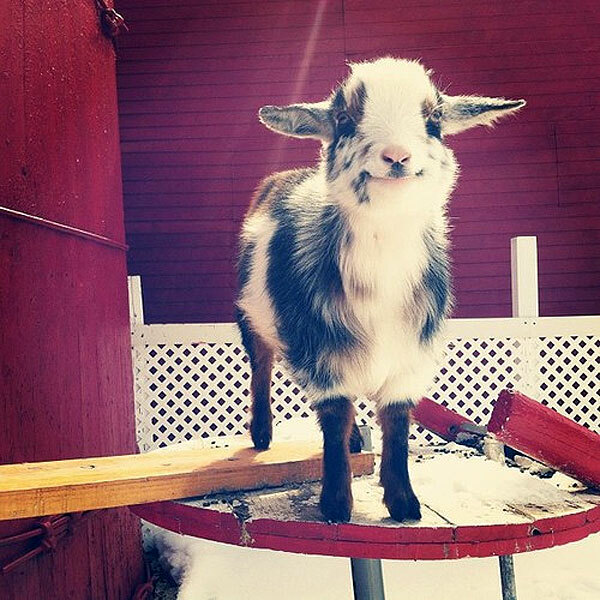 Awww, Happy Goat 😀 I’d like him (her?) to be my new friend. What a splendid idea, a blog Follow Friday. I’m being blatant and adding two very different posts which you might enjoy – or you may hate for all I know! Happy Goat waves to you – he loves to make new friends 🙂 Great posts! I’ve followed, thanks for taking part! Looking forward to reading more. Thanks Victoria, delighted you decided to follow JFC. Give Happy Goat a scritch behind the ear for me please. The cheerful-looking goat made me smile 🙂 I like the idea of a blog Follow Friday. I’ll point you to my latest Playmobil post – Playmobil are celebrating their 40th birthday this month, so I posted a few pictures of my favourite international ads. I think everyone has a soft spot for this great toy. Thanks! And keep up the good work. The goat is becoming a star! I wish I had him as a pet!